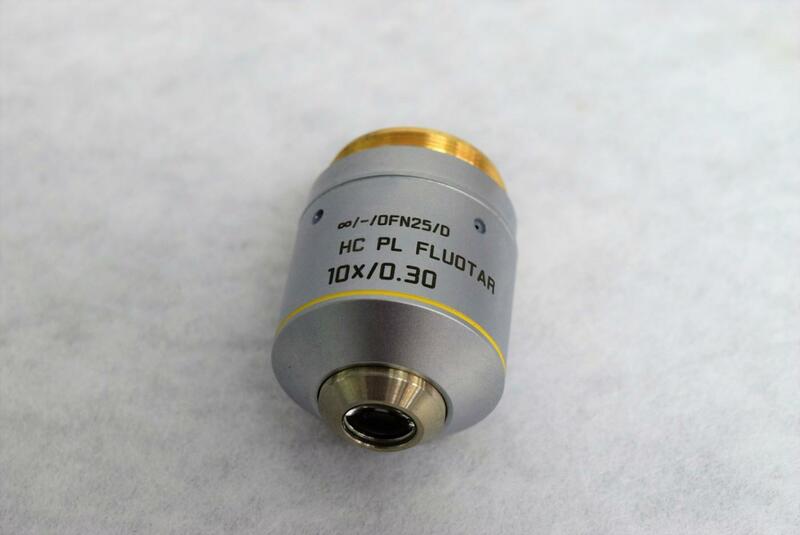 Leica HC PL Fluotar 10X/0.30 âˆž/-/OFN/D Microscope Objective Part No. 506505 . New Life Scientific, Inc. This Leica 506505 objective is from a 2015 Leica DM4 B microscope, manufactured in Germany. It's a semi-apochromatic, universal PL Fluotar objective that features good chromatic correction for visible wavelengths. This makes it well suited for standard fluorescence microscopy. This would be an excellent objective in confocal microscopy, as it is an economical choice for overview images and imaging within a limited wavelength range. New retail price on this objective is well over $1000 new. Why pay that exorbitant price when you can purchase it at our lower price and save. Our technician inspected the objective and confirms it to be in excellent condition.